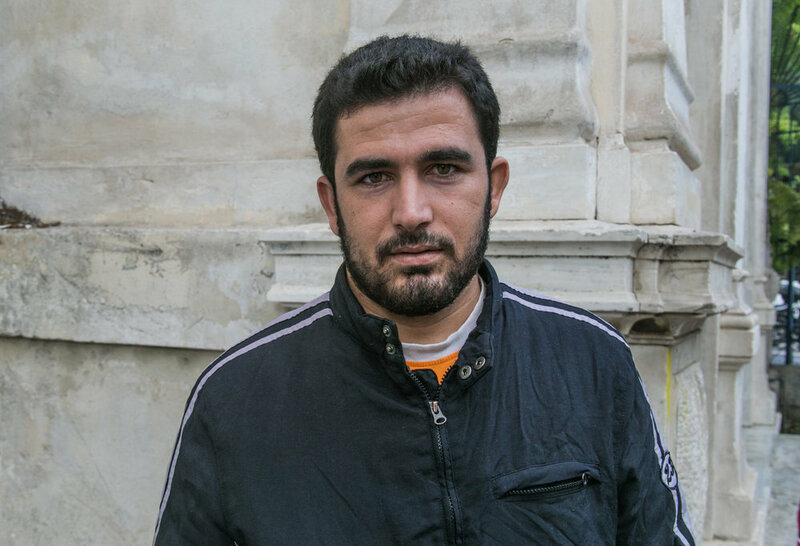 Michael covered the refugee crisis in Greece during the height of migrant arrivals in 2016. 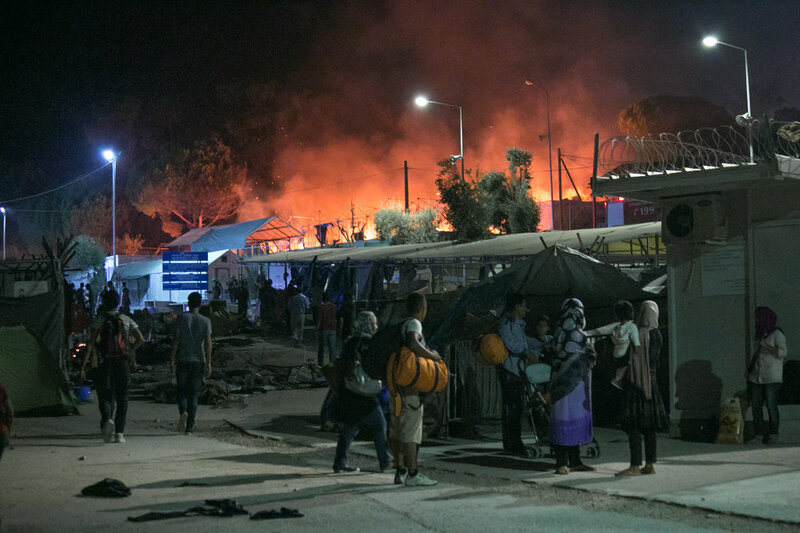 Capturing the Moria riot fires - Michael's work was published across 32 publications internationally including The Huffington Post, The Guardian, and Associated Press Greece. After the riots, a media rush pushed Michael back to Athens. Here, he focused his imagery on families living in abandoned buildings, or unofficial "refugee squats". While technically illegal - he local government allowed these uninhabited buildings to fill up to relieve pressure on the already growing homeless refugee population. While the living conditions in these buildings bordered on inhumane - it was a luxurious alternative to the streets - or worse, a camp. Michael noticed the problems of violence, sexual assault, and theft were not a problem in the squats. When left to govern themselves, the refugees seemed to get along, even in the worst of conditions (as seen in Jasmine School). 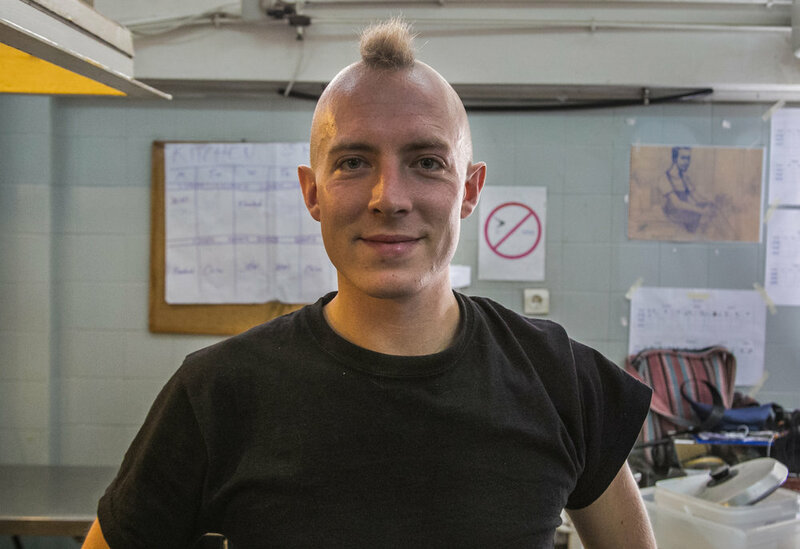 Michael spent a few weeks embedding himself into Jasmine School squat in central Athens. 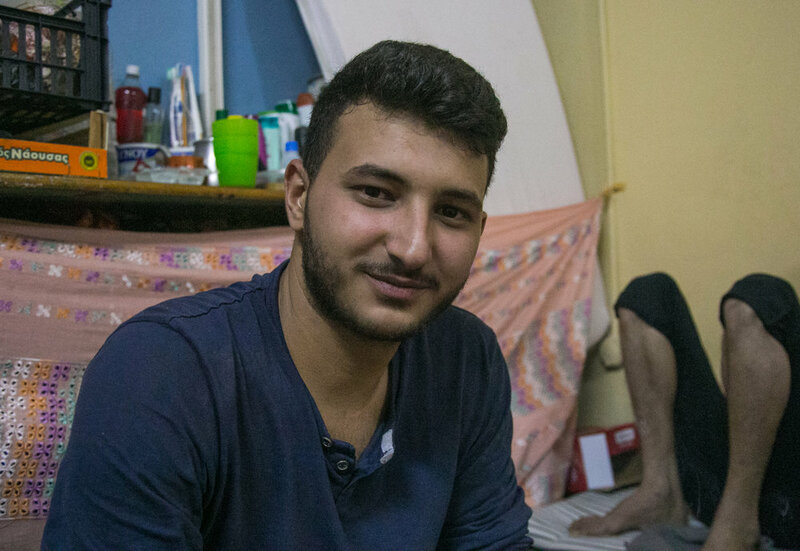 Here he befriended a group of twelve 20-30 year old Syrian men living in one room, and a Syrian family of five living across the hall. To set his article apart from the glut of refugee coverage being produced at the time, Michael worked to present a tentative solution to the problems seen in camps like Moria. The squats (for the time being) were a perfect solution - one that was not receiving the government support it deserved. 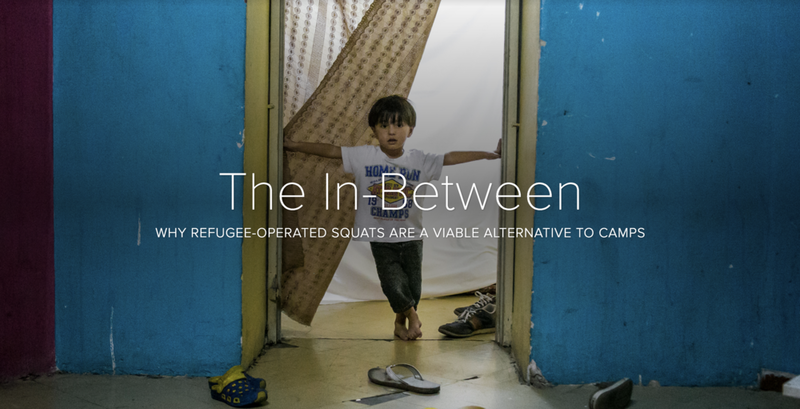 Michael's article details the problems with government-run refugee camps, and programs the everyday reader can support to help aid refugee-operated squats. 09/19/16 - 2:30pm: Greek riot police return to their compound as a crowd of migrants gathered to chant and throw rocks. 09/21/16 - 12:00pm - Moria Refugee Camp: Injuries allegedly inflicted by Greek police officers. 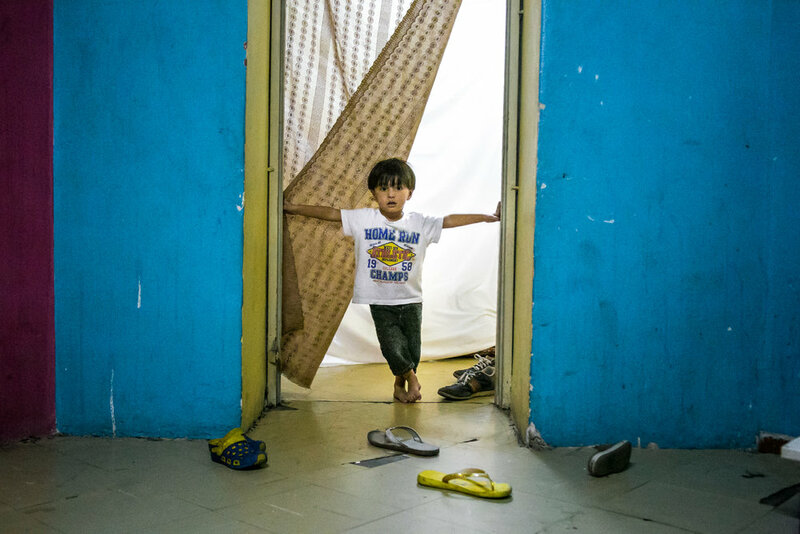 10/14/16 - Ali Alowi stands in the blanketed doorway of his families living quarters. The room (20x20) is split in to four sections, and houses four families. 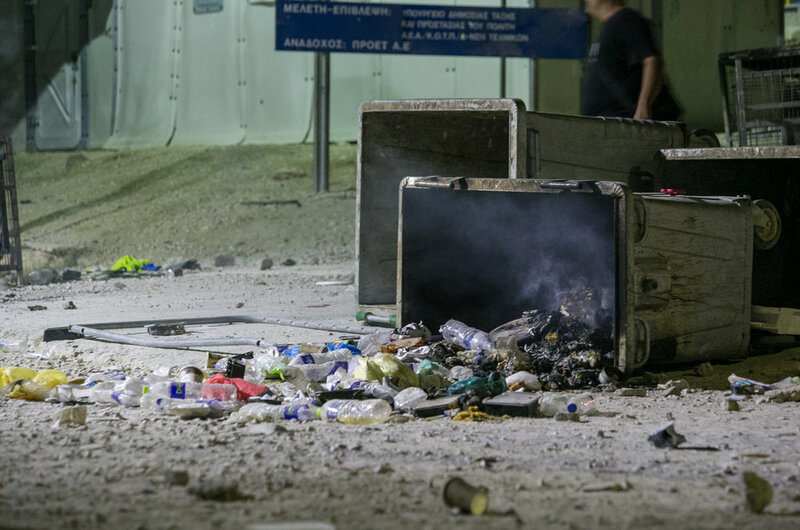 09/19/16 - 9:30pm - Smoldering trash spills out of an overturned dumpster during the Moria riots. 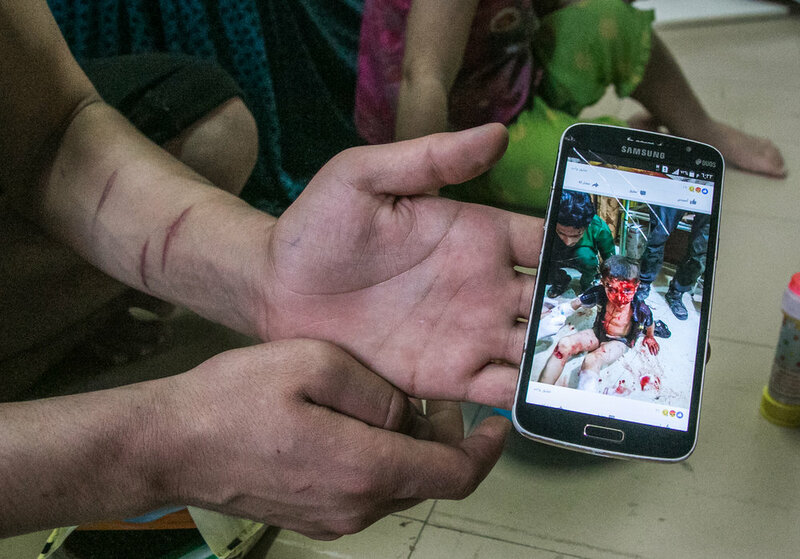 09/26/16 - A Syrian migrant displays a photo from his Facebook page of an injured boy during an attack in Alleppo, Syria that same day (Sept. 17, 2016). The scars on the mans arm are from a suicide attempt while he was staying in a camp outside Athens. 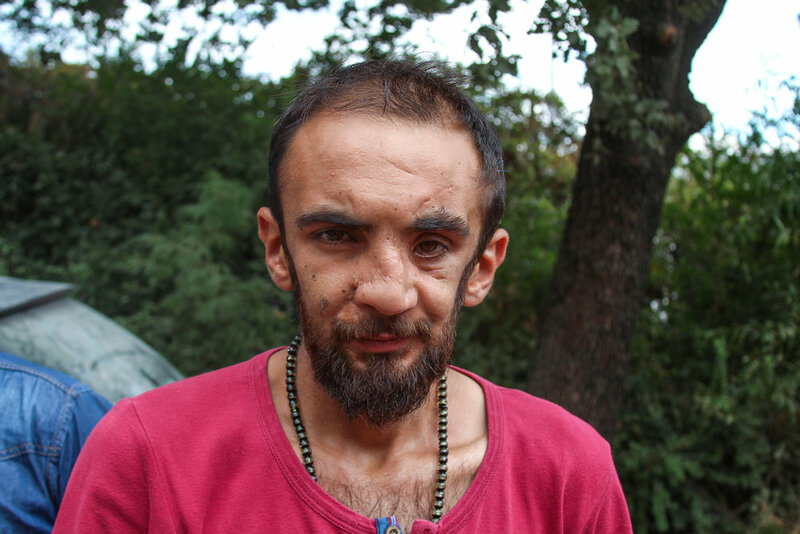 "I lost my country," he told me. He is 21 years old. 10/17/16 - Men sit outside the entrance to Jasmine School. 10/18/16 - A young refugee looks out over the courtyard of Jasmine School through the bars of the third floor window. 10/13/16 - The main spiral staircase of Jasmine School is lined with chicken wire to prevent children from falling through the gaping holes in the railing. 10/12/16 - Syrian refugees enjoy their only meal for the day in an abandoned Jasmine School classroom. The meal consists of rice, mixed vegetables, and pita bread. The portion shown is divided between ten Syrian men (aged 20-30 years old) all living in the same room. "It is so much better than camp food," one man said. "It is Syrian. The women cook it for us. What is better than that?" 10/15/16 - An unnamed refugee stands outside the Jasmine School squat. Many men would sit on the stoop all day - simply watching their children play in the courtyard, and waiting for their papers to be processed. 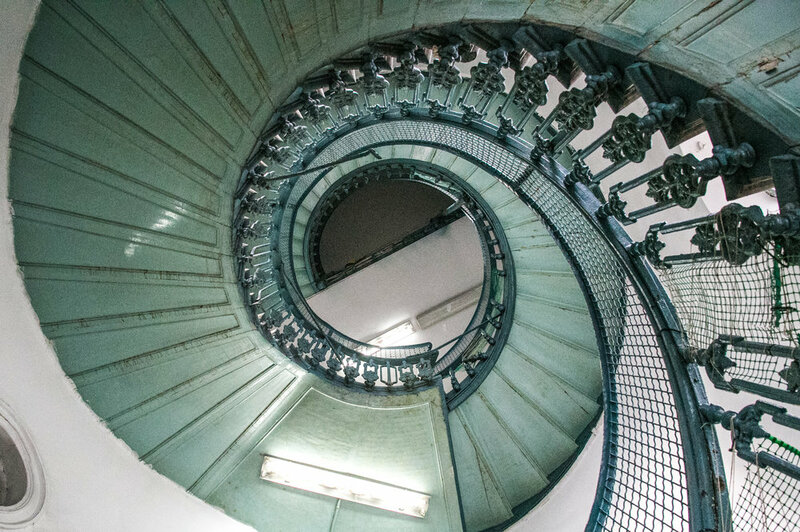 10/12/16 - Two Syrian refugees walk down the main spiral staircase of Jasmine School. 10/17/16 - Children play in the courtyard of the once-abandoned Jasmine School Refugee Squat. 10/19/16 - Ali Alowi and his mother walk through the dark hallway of the third floor corridor. 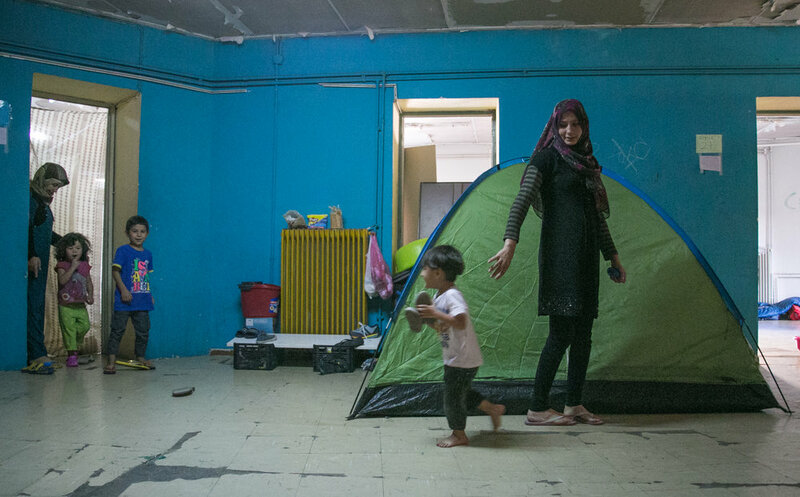 Tents take up any free space available in the school as refugees attempt to escape the dangers of the streets. 10/18/16 - Ali Alowi and his father relaxing in the bed they all share as a family. 10/19/16 - A group photo of the 4th floor boy’s room in Jasmine School (age 15-32) - all single. These 12-14 men (not all pictured) shared this single room, dinner, and bedding every night. 10/19/16 - Children play in the lobby of Jasmine School. 10/19/16 - Ali Alowi stands on while a man begins his evening prayer. The Jasmine School barber cuts a man's hair in the hallway of the second floor. Haircuts are three euro. 09/24/16 - 2:00pm: Mothers and their children stand outside while the lobby of City Plaza Refugee squat is cleaned. 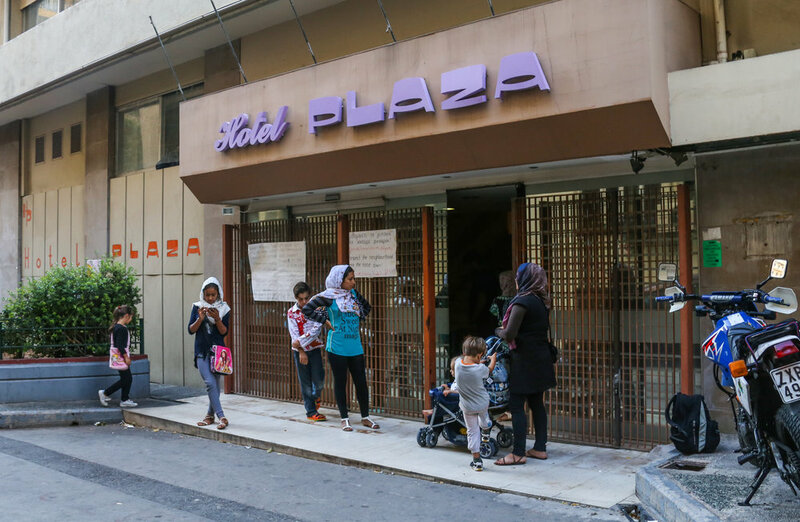 The abandoned 7-story hotel now houses 400 migrants (180 of those children). 09/26/16 - German volunteer Max H. cuts chicken cutlets in the kitchen. "I am here because I like to cook," he said. 09/26/16 - Laundry hangs out to dry on the balconies of the 7-story City Plaza Hotel. 09/26/16 - Plates of food are given out at lunch time using a meal ticket system. 09/26/16 - Hamit M., an Iranian refugee living in City Plaza for four months, sits in the bar area before dinner. 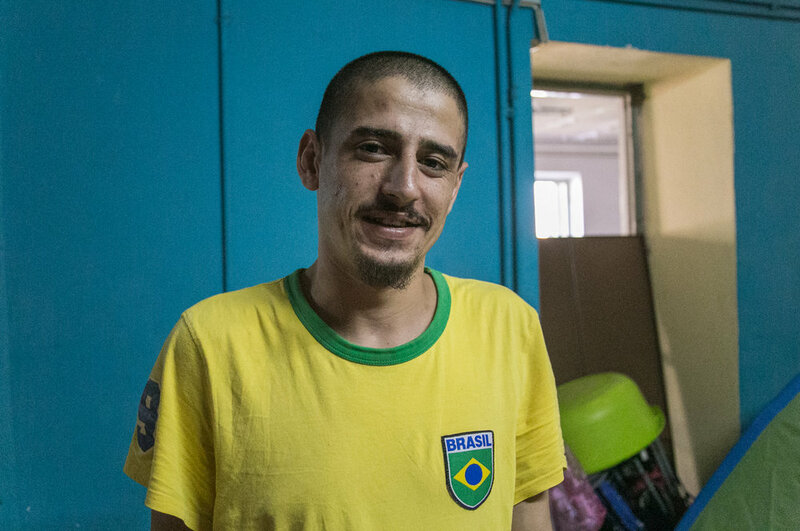 Hamit often assists in the kitchen and cafeteria area. On this day he arranged all the chairs and tables in preparation for dinner.